IHS reported 2.01b mobile phone displays shipped in 2017. The mobile phone category includes both feature phones and smartphones. Most researchers put the 2017 smartphone market at 1.4 to 1.5b. LTPS TFT LCD panels, which are used in high pixel density smartphones increased by 21 percent to 620m units in 2017 compared to the 490m 2016. Shipments of a-Si TFT LCD mobile phone panels declined 4% to 979 million units during the same period. Even though shipments of AMOLED panels jumped in the second half of 2017 thanks to the launch of the iPhone X, combined with the weak demand in the first half, its shipments were up just 3 percent to 413m in 2017. In the LTPS TFT LCD market, Tianma had significant growth, expanding its shipments to Chinese smartphone set brands, such as Huawei and Xiaomi. In 2017, Tianma shipped 105 million LTPS TFT LCD panels for smartphones, almost double its shipments in 2016, with a market share of 17 percent, up 6 percentage points from 2016. It ranked the second largest LTPS TFT LCD supplier for smartphones in 2017, taking over LG Display with 16 percent, down 4 percentage points, and Sharp with 13 percent, down 1 percentage point. In 2017, Japan Display continued its market leader position but shed its share by 10 percentage points to 26 percent in 2017, according to the latest Smartphone Display Intelligent Service report by IHS Markit. IHS did not include the LTPS backplanes used by OLED displays, so we added them in the table below. 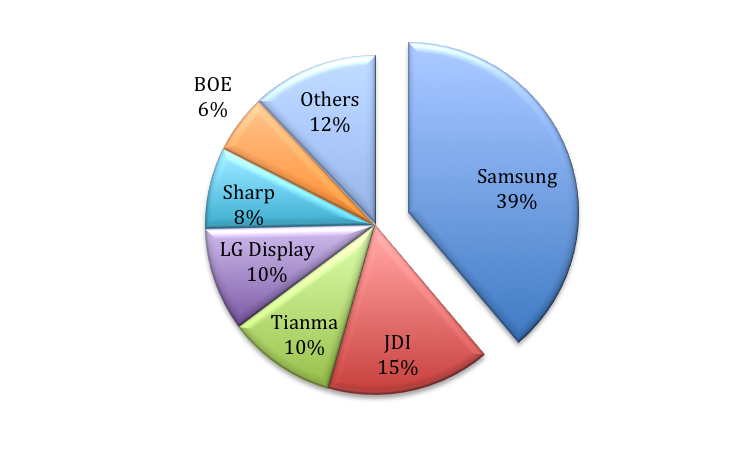 The pie chart shows that Samsung is by far the leader in LTPS TFT production, followed by JDI, Tianma and LG.